Acid maltase deficiency (AMD) is an autosomal recessive disease characterized by an excessive accumulation of glycogen within lysosome-derived vacuoles in nearly all types of cells. Excessive quantities of free extralysosomal glycogen also have been described. AMD first was described by JC Pompe in Amsterdam in 1932; Pompe reported the case of a 7-month-old girl who became fatally ill from what appeared to be pneumonia. An autopsy revealed an unusually enlarged heart with normal valves. Pompe called this condition cardiomegalia glycogenica diffusa and considered it a disease analogous to von Gierke syndrome. The first article by Pompe was followed by similar reports by 2 independent authors, who described children with severe muscle weakness and cardiomegaly who died in early infancy. Their disease was attributed to an excessive deposition of glycogen in various tissues. This entity was named Pompe disease, and in 1957, GT Cori classified it as type II glycogenosis. See the image below. Glycogen molecule; by cleaving glycogen's 1,4 and 1,6 alpha-glycosidic linkages, the enzyme acid maltase gives rise to free glucose molecules. Acid alpha-1,4 glucosidase (acid maltase), like other lysosomal enzymes, is synthesized as a precursor form (molecular weight 105,000) in the endoplasmic reticulum. The precursor molecule then is modified by the addition of a mannose-6-phosphate recognition signal that allows its transport to the lysosomes. Then, the acid maltase is partially degraded into a mature form with a molecular weight of 76,001. The gene for acid alpha-glucosidase is on chromosome band 17q23. 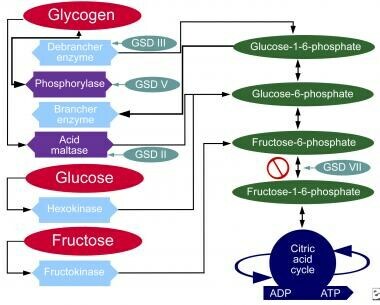 Acid maltase cleaves glycogen 1,4 and 1,6 alpha-glycosidic linkages. Its action gives rise to free glucose molecules (see History). [5, 6] See the images below. Nearly 35 distinct mutations have been identified in the q23-28 locus of chromosome 17, which encodes acid maltase. Establishing the genotype-phenotype correlation is difficult; however, the severity of mutation usually correlates with the severity of the disease. Deletions or missense mutations (mutations in which the base replacement changes the codon for one amino acid to that for another) usually are associated with the infantile variant (Pompe disease), whereas "leaky" (partial) mutations are associated with the childhood and adult forms of acid maltase deficiency. The absence of acid maltase leads to an excessive accumulation of glycogen in lysosome-derived vacuoles. The presence of abnormal quantities of glycogen disrupts the normal architecture and function of the affected cells. 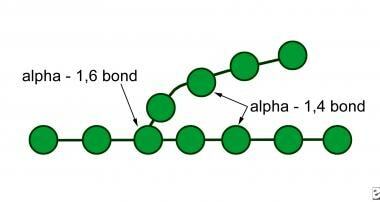 The excess glycogen is expected to be, at least initially, in the vacuolar system. This has been found to be true in the liver and in other tissues; in muscle, however, most of the polysaccharide appears to be extravacuolar, possibly reflecting the fact that the glycogen is packed so densely in skeletal muscle that the surrounding membrane is difficult to see. Another possibility is that the intense pressure exerted on the vacuoles during muscular contracture causes them to rupture, allowing the contents to spill over into the cytosol. Abnormal storage of glycogen occurs in many organs, including the central nervous system (CNS), heart, liver, and skeletal muscles,  thus leading to hypotonia; weak, bulky muscles; macroglossia; cardiomegaly; and congestive heart failure. The intramuscular storage of glycogen is more severe in Pompe disease than in any other glycogenosis. Pompe disease, or infantile acid maltase deficiency, occurs in 1 out of 50,000 live births. Pompe disease is inherited as an autosomal recessive disease. In the infantile form, death usually occurs between ages 6 months and 2 years; however, a less severe infantile form, with a better prognosis and improved survival, has been identified. Patients with the late infantile form may survive for several years. Patients with either the juvenile or adult form of acid maltase deficiency (each of which is also known as late-onset AMD) have been known to survive into the sixth or seventh decade of life. The clinical presentation may vary considerably, and some cases may go undetected; hence, the life expectancy for these groups is not exactly known. No ethnic predilection exists in connection with acid maltase deficiency. Acid maltase deficiency occurs with equal frequency in males and females. The correlation of acid maltase deficiency with age depends on the form of the disease. Morales JA, Bhimji SS. Glycogen Storage Disease, Type II (Pompe Disease). 2018 Jan. [Medline]. [Full Text]. Fukuda T, Roberts A, Plotz PH, et al. Acid alpha-glucosidase deficiency (Pompe disease). Curr Neurol Neurosci Rep. 2007 Jan. 7(1):71-7. [Medline]. van der Ploeg AT, Reuser AJ. Pompe's disease. Lancet. 2008 Oct 11. 372(9646):1342-53. [Medline]. Bembi B, Cerini E, Danesino C, et al. Management and treatment of glycogenosis type II. Neurology. 2008 Dec 2. 71(23 Suppl 2):S12-36. [Medline]. Richard E, Douillard-Guilloux G, Caillaud C. New insights into therapeutic options for Pompe disease. IUBMB Life. 2011 Nov. 63(11):979-86. [Medline]. Manganelli F, Ruggiero L. Clinical features of Pompe disease. Acta Myol. 2013 Oct. 32(2):82-4. [Medline]. [Full Text]. Hagemans ML, Winkel LP, Van Doorn PA, et al. Clinical manifestation and natural course of late-onset Pompe's disease in 54 Dutch patients. Brain. 2005 Mar. 128(Pt 3):671-7. [Medline]. [Full Text]. Hagemans ML, Winkel LP, Hop WC, et al. Disease severity in children and adults with Pompe disease related to age and disease duration. Neurology. 2005 Jun 28. 64(12):2139-41. [Medline]. Hagemans ML, Hop WJ, Van Doorn PA, et al. Course of disability and respiratory function in untreated late-onset Pompe disease. Neurology. 2006 Feb 28. 66(4):581-3. [Medline]. Muller-Felber W, Horvath R, Gempel K, et al. Late onset Pompe disease: clinical and neurophysiological spectrum of 38 patients including long-term follow-up in 18 patients. Neuromuscul Disord. 2007 Oct. 17(9-10):698-706. [Medline]. Van der Beek NA, Hagemans ML, Reuser AJ, et al. Rate of disease progression during long-term follow-up of patients with late-onset Pompe disease. Neuromuscul Disord. 2009 Feb. 19(2):113-7. [Medline]. Vissing J, Lukacs Z, Straub V. Diagnosis of Pompe disease: muscle biopsy vs blood-based assays. JAMA Neurol. 2013 Jul. 70(7):923-7. [Medline]. Bembi B, Cerini E, Danesino C, et al. Diagnosis of glycogenosis type II. Neurology. 2008 Dec 2. 71(23 Suppl 2):S4-11. [Medline]. Jones HN, Crisp KD, Robey RR, Case LE, Kravitz RM, Kishnani PS. Respiratory muscle training (RMT) in late-onset Pompe disease (LOPD): effects of training and detraining. Mol Genet Metab. 2016 Feb. 117 (2):120-8. [Medline]. Parenti G, Andria G. Pompe disease: from new views on pathophysiology to innovative therapeutic strategies. Curr Pharm Biotechnol. 2011 Jun. 12(6):902-15. [Medline]. Nicolino M, Byrne B, Wraith JE, et al. Clinical outcomes after long-term treatment with alglucosidase alfa in infants and children with advanced Pompe disease. Genet Med. 2009 Mar. 11(3):210-219. [Medline]. Anderson LJ, Henley W, Wyatt KM, et al. Effectiveness of enzyme replacement therapy in adults with late-onset Pompe disease: results from the NCS-LSD cohort study. J Inherit Metab Dis. 2014 Jun 7. [Medline]. Van den Hout H, Reuser AJ, Vulto AG, et al. Recombinant human alpha-glucosidase from rabbit milk in Pompe patients. Lancet. 2000 Jul 29. 356(9227):397-8. [Medline]. Rossi M, Parenti G, Della Casa R, et al. Long-term enzyme replacement therapy for Pompe disease with recombinant human alpha-glucosidase derived from Chinese hamster ovary cells. J Child Neurol. 2007 May. 22(5):565-73. [Medline]. Kuperus E, Kruijshaar ME, Wens SCA, et al. Long-term benefit of enzyme replacement therapy in Pompe disease: A 5-year prospective study. Neurology. 2017 Dec 5. 89 (23):2365-73. [Medline]. Schoser B, Hill V, Raben N. Therapeutic approaches in glycogen storage disease type II/Pompe Disease. Neurotherapeutics. 2008 Oct. 5(4):569-78. [Medline]. [Full Text]. Güngör D, de Vries JM, Brusse E, Kruijshaar ME, Hop WC, Murawska M, et al. Enzyme replacement therapy and fatigue in adults with Pompe disease. Mol Genet Metab. 2013 Jun. 109(2):174-8. [Medline]. FDA. FDA expands approval of drug to treat Pompe disease to patients of all ages; removes risk mitigation strategy requirements. US Food and Drug Administration. Available at http://www.fda.gov/NewsEvents/Newsroom/PressAnnouncements/ucm407563.htm. Accessed: Apr 28, 2016.